Lapland in the far north Europe is an adventure of a lifetime for travelers who have an opportunity to tour the region and explore its natural wonders. The landscape varies from undulating fells to vast forests, from flat marshlands to fish-rich rivers, and from snow-capped mountains to spectacular fjords. Lapland: North of the Arctic Circle in Scandinavia is a guidebook for all travelers who want to experience the nature, Sami culture, sceneries and plunge into adventures the region has to offer. The book provides all the essential information about Lapland for independent travelers and for tourists who are traveling with a group. It features special sections for road travelers who are new to Nordic seasons and road network. The book provides plenty of tips for the road, including route suggestions and maps. The reindeer is the iconic animal of Lapland, but there is plenty of wildlife to discover in the region. Inland fell regions have their own flora and fauna, whereas coastal areas support a totally different wildlife. Numerous natural parks are excellent places for exploring the nature, even though in Lapland, wilderness is practically everywhere. Everyman’s Rights have long traditions in Scandinavian countries. The book explains what the Rights really mean and what they allow for visitors. Common peculiarities of the Sami and Scandinavian cultures are explained as well, including the all-important sauna etiquette. Sami people inhabited Lapland long before the current population moved in to the region. 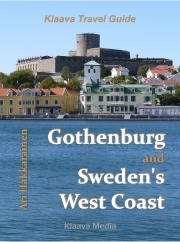 Sami history and places where you can explore the culture are highlighted in the book. Special features include information on the Northern Lights (Aurora Borealis) and tips for road travelers for reaching the continental Europe’s northernmost place, Nordkapp (North Cape). The book features hundreds of photographs and maps that help you plan your trip, and tour the places that specifically interest you and your travel companions. Here you can view sample content extracted from the book. Also available at Tolino stores in Europe.